On Saturday, between the soccer matches, Diego and I headed to the market in the disctrict of Magdalena. Magdalena is a busy, more working class neighborhood just to the west of Jesus Maria. It's streets are a bit more chaotic, what with the mototaxis that are permitted on its streets but banned in the surrounding districts of Jesus Maria, San Isidro, and Pueblo Libre. The chaos is somewhat reflected in its market, which is a warren of narrow alleyways often barely widenough for two to walk abreast, and at times not even that. At one time Magdalena mut have been home to Italian immigrants as it had a n umber of bakeries and pasta makers, which my mom liked to shop at. Today, it is home to immigrants from all over Peru, and this is also reflected in the market, which offers a wide selection of products from all over the country. Thus, it is where Diego and I head to when we wish to purchase foodstuff from the jungle. The last time I went there, last year, we managed to get a haunch of agouti, but had no similar luck this time. Instead whe bought some sausage, smoked peccary meat (called cecina), banana leaves, hot peppers, and a jungle herb called sachaculantro, which tastes and is used just like cilantro. Our plan evolved into our cooking juanes, a classic dish from the northern jungle regions, specially Tarapoto, Loreto, and Ucayali, for the Sunday meal. 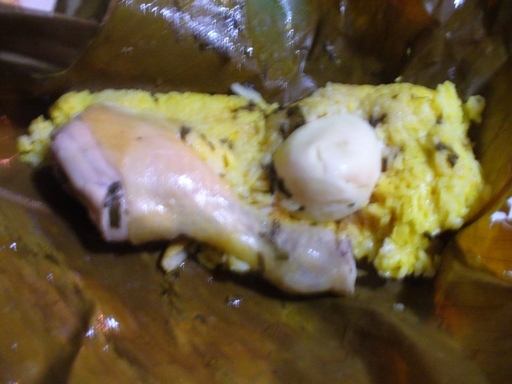 Juanes - or "fanes", as jungledwellers pronounce it- are bundles of turmeric and garlic scented rice with meat (usually chicken or hen), hardboiled egg, sachaculantro, and sometimes other accompaniments, wrapped in banana, bijao, or achira leaves. That plan necessitated a second trip today, Sunday, to procure chicken pieces for the juanes, and fish for a soup. While we were at the Jesus Maria market, Jacho called to say that his mom was cooking lunch, so we decided to put the juanes off and have them in the evening, omitting the soup. 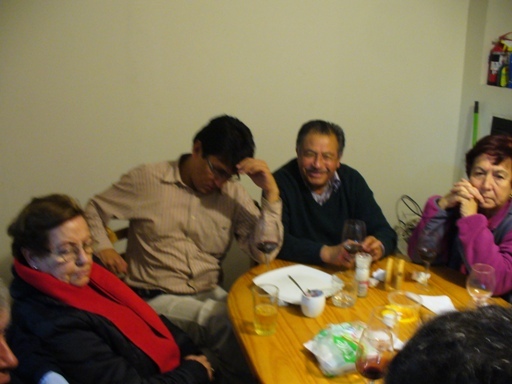 We had my cousins, and several aunts and uncles over for dinner, which we washed down with wine and conversation. The juanes were a hit, even though -making them for the first time, and under time pressure to finish them before heading over to lunch at aunt Betty's- we forgot to bind the rice with beaten egg before assembling and steaming the bundles.